We are engaged in offering a very high quality range of Henna Cone. Our henna cones are packed in designer poly foils to ensure that the henna paste is not adulterated. These can be used for applying on palms, hands, legs, etc., and also for making tattoos. Pre-made India henna cone, ready to use right out of the package. One cone is enough henna for about 25-30 medium size henna designs. Dark staining and easy to use. This is 100% natural pre-made henna in a traditional style application cone direct from India. Mehboob henna produces a dark brown to dark red stain every time and we receive new shipments weekly so you are assured of the freshness. Very easy to use just cut the tip off of the cone and you are ready to go, each cone contains 33 grams of premixed henna paste, enough for 30 designs. These cones will last for 3-4 months on the shelf or up to 6 months when kept in the refrigerator or, freeze them for years of freshness. Thin or thick lines you choose by cutting the tip of the cone where you want it. You will never mix henna powder again once you try our cones. So go ahead and stock up! 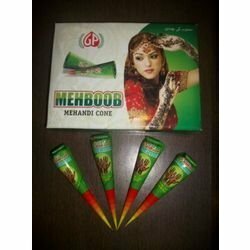 We guarantee you'll became a lover of our mehboob henna cones after using them. This product is chemical free. Available in 40 gm packing black henna cones are of very high quality, closest to nature and give very dark and intense coloring effect on the skin. These black henna cones are manufactured without using any chemical dyes. Black henna cones can be used to decorate hand, feets and nails.